Available in your choice of three colors the Executive Gourmet gift basket is package in one reusable 12" classic faux leather container. This satin lined box is abundantly filled with chocolate chip cookies, savory snack mix, peanut butter filled pretzels, French chocolate truffles, chocolate filled peppermint drops, smoked almonds, Brown & Haley Almond Roca and Bellagio chocolate truffle cocoa. 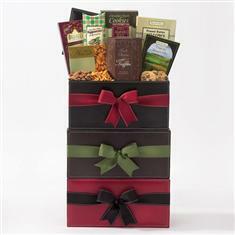 Say thank you today with our yummy Executive Gourmet gift basket!